Today in Salzburg, at 11am local time, Mozart's recently discovered Allegro Molto in C Major was performed in the Tanzmeistersaal of the Mozart Wohnhaus, a former residence of the Mozart family which is now a museum. The work was performed by Austrian pianist Florian Birsak, a specialist in historical performance practice, on a fortepiano once owned by Mozart. My heart fluttered as I watched the performance video. The physicality of the performer and the sharpness of the sound radiating from Mozart's fortepiano were captured in unprecedented manner. I fell in love with Mozart all over again. Unrelenting joy, inner-sunshine, a prolonged smile. It was an indescribable feeling. I played the video again and again. Irish tenor Michael Kelly's description of the first time he heard Mozart perform the keyboard in public came to mind. "His great feeling, the rapidity of his fingers, the great execution and strength of his left hand particularly, and the apparent inspiration of his improvisation, astounded me." It was an historical day not only for the premiere of the work itself, but for the media which accompanied its reception. I'd seen performance video excerpts on this instrument before, namely via newsreel, and I own recordings of Mozart's fortepiano, but this was an entirely new experience, a heightened experience. Their approach to film with the resulting video narrative of the recording session is indeed an innovation in the presentation of historically informed performance as well as the Mozart history generally. And I do have to mention just how incredibly cathartic and emancipating it was to go to iTunes and purchase a newly premiered Mozart work! As the premise of my advocacy emphasizes modifications of presentation to make Mozart more accessible, relevant and exciting, I truly could not have been happier on this day! According to the Salzburg Mozarteum Foundation, Musicologist Hildegard Herrmann-Schneider discovered a 160-page music book from around 1780 in an attic of a private home in Tirol which included this work explicitly attributed to "Del Signore Giovane Wolfgango Mozart," Italian for "Mr. Wolfgang Mozart, Jr." From the style of composition, Hermann-Schneider believes it was composed around the time when Mozart was 11 years old in 1767. It's interesting to note that Hermann-Schneider appropriately credited Edmund Angerer as composer of the "Toy Symphony" in 1996 which was long thought to have been a work of Mozart's father, Leopold, or Michael Haydn. 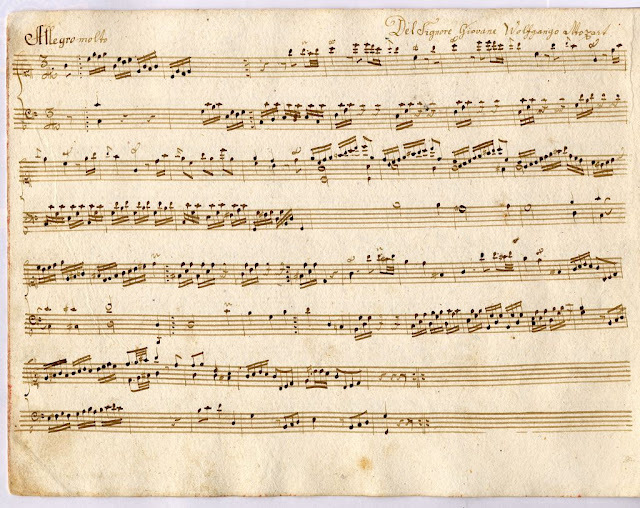 The first page of the Allegro Molto in C Major in the original manuscript. "It's not just anyone's piece, there is already a touch of the great Mozart he later became," said pianist Florian Birsak to the BBC. The Allegro Molto represents the third Mozart discovery within the last six years. Birsak also performed two newly discovered childhood compositions in 2009 at the Wohnhaus. A photo I took of the Mozart Wohnhaus during my first visit to Salzburg. My first encounter with Mozart's fortepiano was, well, how shall I describe it? Well, it was like coming face to face with a holy relic, an experience for which I could never have been fully prepared. Of all the artifacts I viewed in the Wohnhaus and Geburtshaus, his manuscripts, instruments, buttons, a lock of his hair, and other personal effects, his fortepiano was by far the one which captivated me as being the most intimate of all. There is nothing like being able to experience an instrument from which Mozart drew inspiration for his life and eternal melodies. The Tanzmeistersaal in the Mozart Wohnhaus where the premiere took place today. 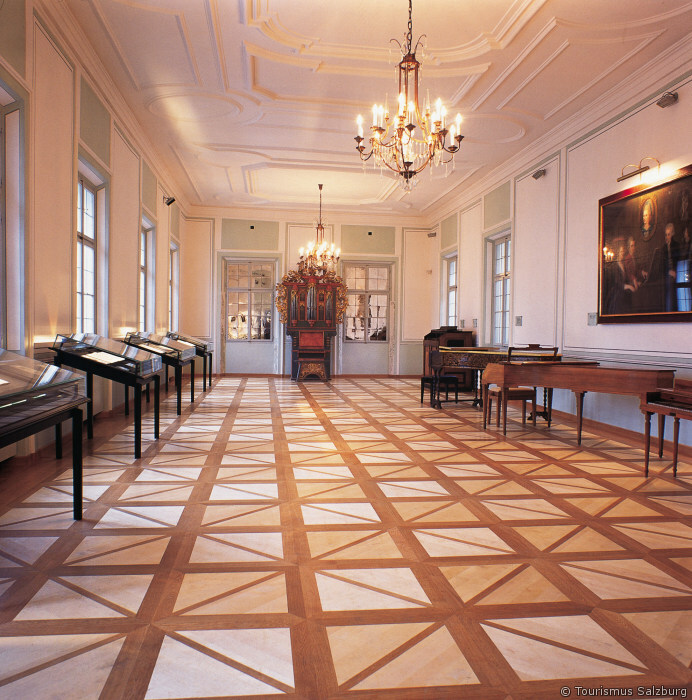 Mozart's fortepiano is pictured at right along with the Mozart family portrait of 1780. 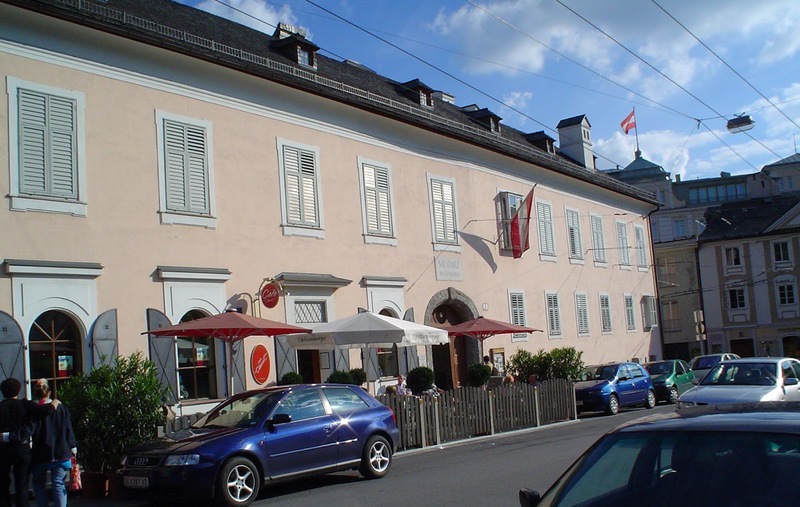 The Mozart family lived at this residence where Wolfgang wrote symphonies, divertimenti, serenades, piano and violin concerti and a bassoon concerto, arias, masses and other sacred music from 1773 - 1780. Image Source: Tourismus Salzburg. 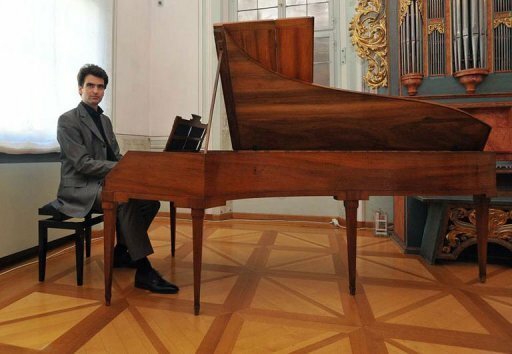 Austrian pianist Florian Birsak poses with Mozart's fortepiano before playing the Allegro Molto in C Major on March 23, 2012 in the Tanzmeistersaal of the Mozart Wohnhaus. Image Source: Mozarteum Foundation. That is so exciting! I wish I could play your video. When I try it say the video is private whatever this means. I tried again and it works like a charm (plus the ads are gone from my ''view'' of your blog as well!! :D) How delightful to listen to this piece and how characteristic! I love it. Magnificent piece from a born genius; it invokes a wistful feeling, in a way. They should include this the next time they make a mozart tribute performance. Thank you for your comment, Roy. I agree with you!